Sarah Herz, right, and Collette Teno, left, will be going on the Chariton Valley Electric Cooperative Youth Tour in Washington, D.C. this summer. 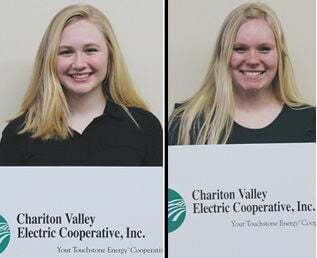 Chariton Valley Electric is pleased to announce two students have been selected to represent CVEC on the 2019 Cooperative Youth Tour in Washington, D.C.
Collette Teno, a senior at Albia Community High School, and the daughter of Danny and Marilyn Teno of Moravia, has also been selected to attend the 2019 Youth Tour. Collette is also very actively involved in school activates including; FFA, Dance Team, tennis, and volleyball. Collette stays busy outside of school by performing with Shannon’s School of Dance, volunteering for Cystic Fibrosis, and St. Mary’s Catholic Church activities. “I would discuss the issues that are important to rural America, like agriculture, healthcare, and taxation,” stated Collette if given the opportunity to speak with a congressional representative. Both will join about 40 other Iowa students – and more than 1,400 high school students from across the U.S. – in Washington, D.C., from June 14-20, 2019. They will get an inside look at the federal government and tour the city, visiting the National Cathedral, war memorials, Smithsonian museums and Capitol Hill. Chariton Valley Electric Cooperative, with the generosity of its membership, is proud to support the Youth Tour program to enrich our Youth’s educational experience.